Dr. Gurdgiev: Irish exports to Russia totalled €46.9 million in September, up 61.2% yoy, against Irish imports from Russia of €7.8 million, up 14.7% yoy. Read full post at trueeconomics.blogspot.com. 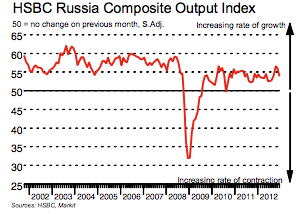 Dr. Constantin Gurdgiev’s concise but comprehensive overview of Russian economy on trueeconomics.blogspot.com.